Watch out Evil! It's the Strange Brigade! Zombie Army Trilogy is a game that I absolutely loved, a title that I really wish more people had been online with during its release. When It was announced that the same team was back developing another third-person co-op shooter, I was beyond excited. Now that I've spent a solid five days pushing through the campaign and each of the five maps available in horde mode, I can unquestionably state that Strange Brigade is an absolute riot! With the action pulled back to a third-person perspective, the Strange Brigade has a very different feel than the other co-op based shooters like Left 4 Dead, Earthfall, or the fantasy-based Vermintide 2. In fact, Strange Brigade carves its own path and it does so with style. Strange Brigade is a tribute to the pulp magazines of the 1920's and 30's as well as several adventure films of the 1950's. 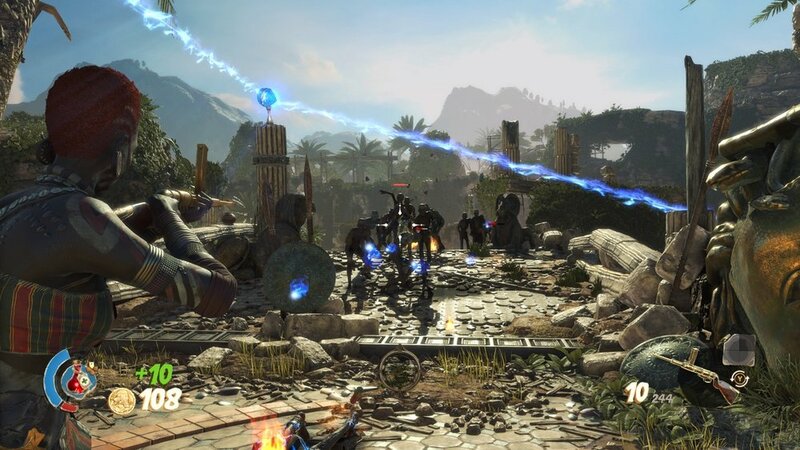 With corny narration and extravagant fonts indicating the names of the numerous locations, enemies and boss encounters, Strange Brigade is a game that simply cannot take itself seriously, nor should it. When an archaeologist unwittingly unleashes an ancient evil upon the world, the Strange Brigade is brought in to make things right. Set in the 1930's, you play as a member of this British Colonial task force charged with putting an end to Seteki, an ancient Witch that once ruled over all of Africa some 4,000 years ago. Your team is made up of a demon hunter from Kenya named Nalangu Rushida, an Oxford Scholar in Professor Archimedes de Quincy, a colonial soldier by the name of Frank Fairburne, and finally, Gracie Braithwaite, a factory worker from Lancashire. This ragtag group of fighters will be facing down hordes of skeletons, zombies, armoured warriors, giant scorpions, and rampaging minotaurs in their quest to put evil down. The team dynamic is only at play should you play alongside other players online and the title can be a very lonely affair should you treat it like a single-player game. Unlike in Vermintide 2 or Earthfall, you are not blocked from using a character that is already chosen and thus allowing you to choose whoever you want. This is especially helpful should you main a certain character and then join a game where it forces you to choose another, like in Vermintide 2 and Earthfall. Throughout each cutscene and spot of action, you'll have a voice-over by a narrator making jokes, explaining certain character traits or things relative to the mission. He'll even joke with you should you pause the game or just remain still for a long period of time. At first, he can come across as a bit annoying and a bit much but he certainly does grow on you. I also can't help but say "the Strange Brigade" without the inflection and energy he adds to make it sound far more dynamic than it should. The narrator was a smart addition to the game that further adds to its charm and character. As you vanquish the numerous enemies that will come at you in floods, you'll earn a powerful essence that charges mystical amulets that each member of the Brigade has on their person. These amulets will help you subdue stronger threats, solve puzzles and their more frequent purpose; unleashing powerful special attacks. While you will start your adventure being limited to just a single special attack per character, such as an area of effect slam or throwing enemies away from you to have them explode, you can unlock more as you discover special relics that are hiding away in each environment. Depending on the level of destruction you and your teammates are dishing out against the waves of skeletons or other supernatural threats, your amulet can regain its power rather quickly, allowing you to unleash special attacks almost back to back. The Strange Brigade can be a very hectic and fast-paced experience that only gets better the more players that have joined your game. Characters are outfitted with a main gun, a pistol, a throwable item like a grenade or Molotov and their amulet. These items can be swapped out for different weapons as you earn the gold to unlock them. You can also upgrade each weapon with a variety of different gems that can be equipped into slots that vary in number from weapon to weapon. Before I spent my entire allotment of gold on a high-end assault rifle, I managed to unlock it in the horde mode and found that the gun had far too much kickback than I was comfortable with. In fact, several guns feature a very shakey kickback that can definitely throw off players expecting an easy time managing their aim. There are a few guns that are far better to control like the Carbine rifle, which ended up being my favourite gun in the game due to its limited kickback and the three slots for gem upgrades like bullets that penetrate through armor, freezing bullets, and a general overall boost to its damage. The kickback present in nearly every gun can certainly turn people off from the game and it's something that I'll go into a bit more. While I eventually found guns that featured far less kickback than others, there are elements to this game that require almost pin-point accuracy that can run counter to its weapon handling. As you start to face down the more intensive enemies like the minotaur, these beasts have targets that will move around their body during different states of their damage and depending on the kickback of your equipped weapon, it can be rather difficult to target. The assault rifle, for example, can make it next to impossible to hit them accurately without coming to a full stop or at the very least slowing down. Given the fact that you are almost always surrounded by enemies at any given moment, this can often result in you either being tackled by another off-screen minotaur or other enemy forces. Early on in my time with the game, I ended up joining in with another player and actually fought alongside them for the entire duration of the campaign. As we teamed up to take down each and every threat that came our way, we started to talk about how playing this as a solo player would certainly make the game far harder than it should be. The minotaurs, for example, can only be damaged when you hit the blue glowing targets on their chest, their forehead and their back. This brought up the question of how a solo player would be able to hit their back without another player drawing their attention allowing you to flank them from behind. While sure, it can be done, it just further illustrates that games like this that are built around co-op should have AI teammates that can simulate at the very least, the way the game is meant to be played. Each character is also equipped with a melee attack that can knock enemies down and then follow it up with a curb stomp bashing that can one-shot some enemies that normally require a considerable amount of bullets to take down. This is especially helpful against enemies that move rather quickly, making it fairly challenging to aim appropriately at them with your rifle. While the melee attacks are fairly strong, they can be somewhat awkward to use without taking damage first. While this is more than likely the result of misjudging distance via the third person perspective, I personally found that some enemies have far greater range than you would normally expect them too. 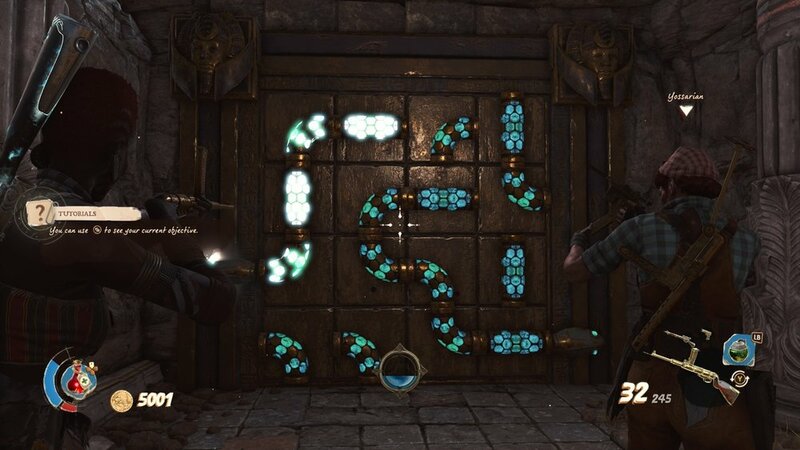 While mostly exclusive to the story campaign, the Strange Brigade is packed full of puzzles that have you playing variations of the memory game, connecting powerlines via rotating tubes (as shown above) or rotating orbs to reflect light. The puzzles themselves are never difficult, but given the fun and carefree style of gameplay accentuated through the title's humor, I don't think they were ever meant to be. That being said, I found that the game reused some puzzles far too often and could have changed things up with an additional puzzle or two. 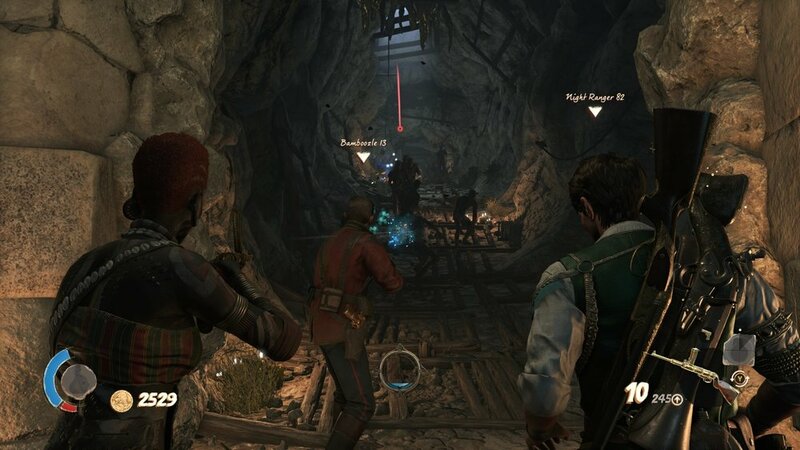 The environments can operate somewhat like that of a deadly puzzle themselves as you can target lamps, barrels, and roped contraptions in an effort to lure enemies toward their doom. There are also spinning blade devices that can chop down waves of enemies with almost no effort at all. 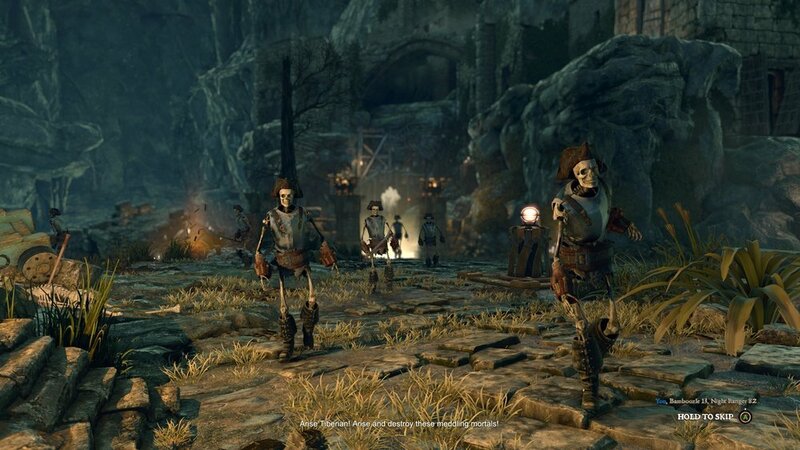 Nearly every room of every location has various ways to assist in the defeat of whatever group of skeletons or armored warriors that are currently stalking you. Several large rooms come packed full of spear traps or fire pits that can decimate anyone that steps foot on them. 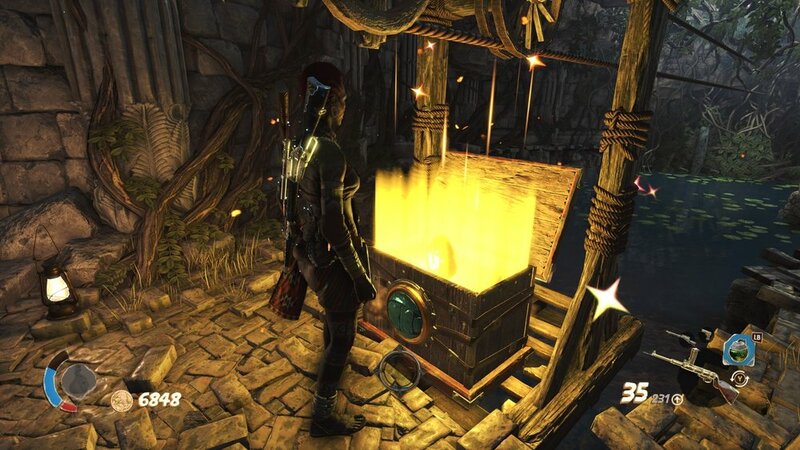 Apart from the traps and deadly contraptions, each location is packed full of collectibles that can assist you in unlocking new special attacks or unlocking even more secret rooms packed full of treasure. Apart from the main campaign and a fast paced score attack mode, Strange Brigade offers up a fantastic horde mode as well. A typical horde mode staple like earning a currency to unlock doors is present with the doors themselves holding out a gold hand expecting you to pony up a specific amount of gold to unlock the riches it contains. These rooms are filled with gems to upgrade your rifles, schematics used to buy temporary weapons, and a few health potions to keep you in the fight. The most expensive room will come attached with a puzzle that once solved will grant you access to a very powerful shotgun. I had a blast jumping into a game with a full squad tossing a grenade down into a mob of a few dozen skeletons, only to have them burst into a puff of dust and coin, leaving a huge smile on my face. While Strange Brigade always did look visually appealing from the various trailers that preceded its release, I didn't expect to be blown away from the visuals as much as I was. While the character models are anywhere from good to great, it is the stunning environments that steal the show here. Each location is expertly detailed, textured, and breathtaking. While some levels can resemble each other and limit the amount of variety the title could have had, the final few locations more than make up for it with their wonderful use of color and design. Strange Brigade is a title that time and time again shows that it is certainly meant to be played with other people and most importantly, with friends. Those looking to treat the title as a single player game may still find enjoyment, but it certainly loses a lot of its charm and pacing by doing so. From its engaging cast of characters and its stunning locales, Rebellion has crafted a truly remarkable title that I hope finds a steady and constant community to keep it going. Until then, evil needs to be put down and there's no one better suited for the task than the Strange Brigade! Strange Brigade was purchased by the reviewer.